might be of some value to those enthusiasts with a modicum of interest in buses serving Australia's 'Top End'. 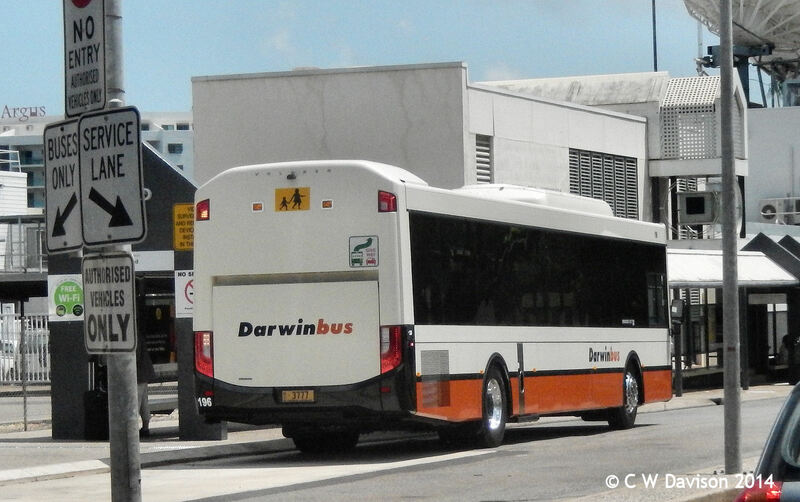 All pix were taken earlier today, Saturday 01/11/14, with 196 [m/o 3777] being sighted in revenue service at and around the Darwin Bus Terminal in Harry Chan Av, while 197 [m/o 3776] (sporting somewhat crude signs in its n/s windscreen proclaiming 'NEW URBAN SCHOOL BUS') was photographed in the Buslink Depot in Pruen Rd, Berrimah. 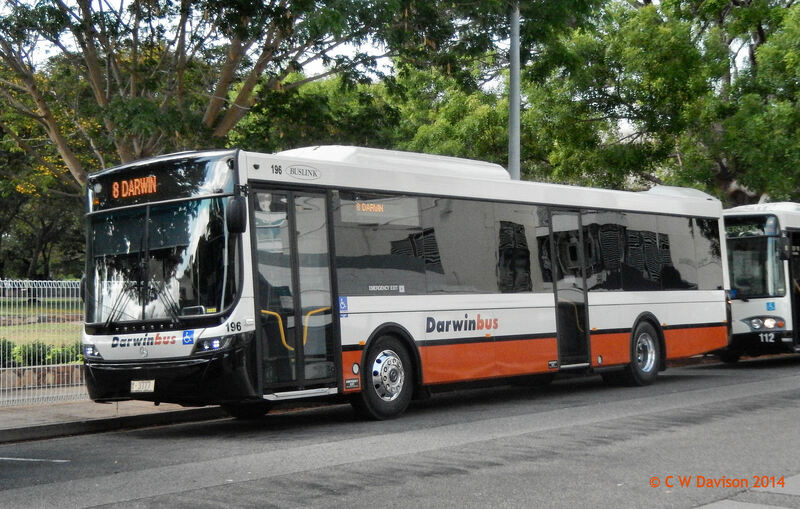 Unlike most of the Darwinbus units I saw during my 3+ days in the NT Capital, neither of these 'newbies' bore the large white fleet numbers on the nsf bumper. Begs the inevitable question - what is the point, if there is no clear and unequivocal reminder about WHY black bumpers appear on these buses ?? Alternatively, perhaps the black bumpers are simply a 'throw back' to a past era when such was the 'fashion' and, perhaps, today's managers are too fearful of 'bucking tradition' ?? However 'outworn' or 'redundant' the tradition might have become ?? Buslink buses do not have fleet number on nsf bumper only Territory transit (formally Darwin bus service) have it with the exception of #110 which is currently missing it. Which, alas, remains dismal black, rather than being painted in the 'tan' or 'burnt orange? Thanks for that info, CM Hino. I've looked through my pix of other Buslink units and now realise my error. And the tie in with the NT flag colours does make sense - I suspected there was some logic to the bus livery, but had not figured it out. Looking at the picture of 196 and 112 Mercedes OH1830 which has the fleet number on the bumper and the bus belongs to Buslink Vivo. Bedford-29 wrote: Looking at the picture of 196 and 112 Mercedes OH1830 which has the fleet number on the bumper and the bus belongs to Buslink Vivo. You are confusing Territory Transit's 112, a Volgren B42DW bodied Volvo B10BLE, mo 3812 (ex mo 8.112) with Buslink's 112, which is a Bustech C57F bodied Mercedes Benz OH1830, mo 3140. TT 112 (Volvo) does not have the logo above the front door - appears to be recently repainted, so it might be a detail overlooked. For comparison, here is Buslink's 120, mo 2653, which is fairly similar to 112, I imagine. And to confirm what CM Hino said earlier, here is Territory Transit's 110, mo 3844, with logo above the front door, but nil white number on the nsf bumper. Note that the fleet list for Territory transit is not complete. As Genman is waiting on me for the conformation of all the new rego numbers before he places them on the fleet list. Also buslink Vivo does not have any track buses. Many thanks for posting the pic of Buslink Vivo 112, m/o 3468, with Volgren SC222 body, CM Hino. I must confess that I had 'missed' noticing there are actually 3 (THREE!!) 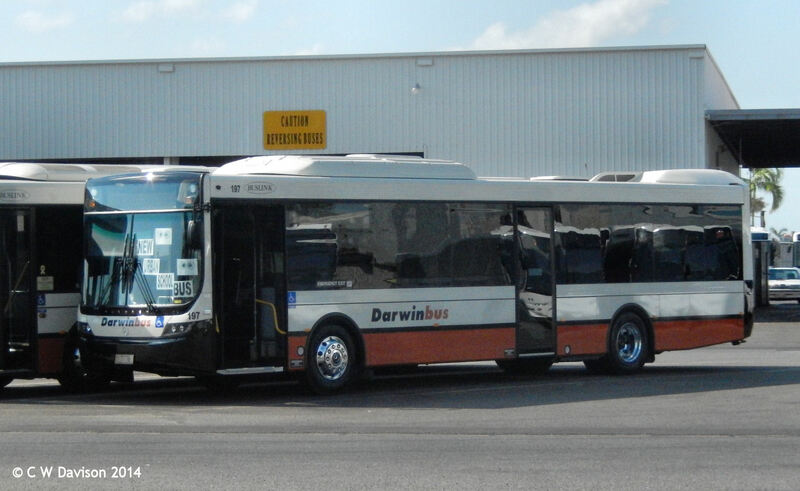 different buses numbered 112 (and 'triplicates' of several other numbers, it seems) operating in the Darwin area. No wonder Bedford29 got confused - so did I !! Goes to show, 'local knowledge' goes a long way in cases like this. Do you perchance have a pic of Buslink 112, m/o 3140, with Bustech Graduate body that you could share here? I am curious to learn if it looks similar to Buslink 120, as posted earlier.